Updated Sunday March 10, 2019 by POB Soccer. 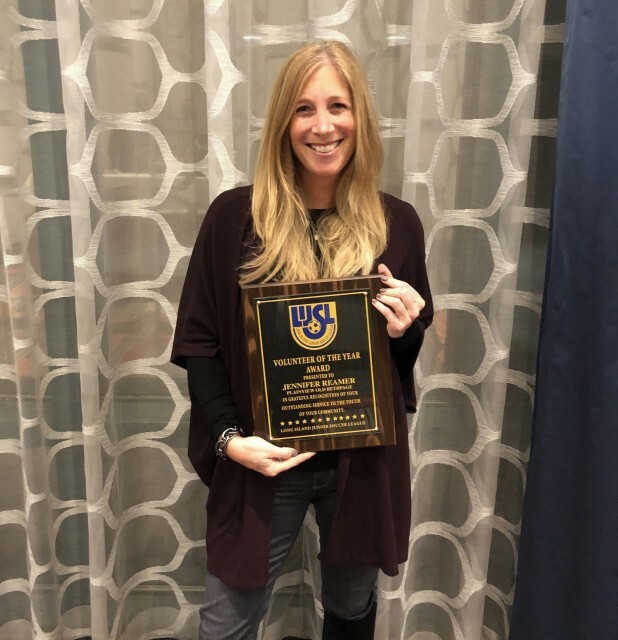 On Friday evening March 8, 2019 Jennifer Reamer was honored by Long Island Junior Soccer League as the POBSC Volunteer of the Year. Jennifer has a long successful history as a Executive Board member and Executive Committee member for Plainview-Old Bethpage Soccer Club. She began volunteering 10 years ago as a Division Head for the Bu11-Bu19 travel soccer teams. For the last seven years, she's been an active Exectuive Board member, first as club secretary, and today, as a trustee in charge of the club's Referee, as well as, the Little Nuggets 3-year old programs. She is married to her husband Rich, who coaches both their children in the travel program. Rich also volunteers as the u10 Boy's and Girl's Division Head. Brooke is completing her final year in travel soccer in Gu19, and Jacob who plays in Bu16. Please share with us in congratulating Jen for all that she does for the children in the POBSC and within our entire community.